Prior to 1901, the spiritual needs of the community were met under the direction of the Rev. Albert Balgooyen, a young Methodist minister. Since there was no church building proper, services were conducted in private homes. The present church property was donated by the Charcoal Iron Company at the turn of the century. The Methodist Episcopal Church of McMillan was organized in 1901. The building was erected in 1908 with the Rev. D. C. Nye as pastor. The church has been meeting the spiritual needs of the community since then. 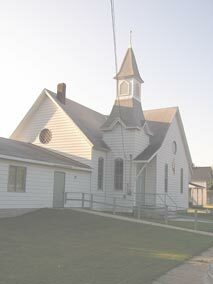 In 1978 an education/fellowship hall was added to the church building. By 1983, church membership was 20. Sunday School attendance was in the 18-20 range and the United Methodist Women had a membership of 12. The congregation celebrated their 75th anniversary July 10, 1983 with an anniversary sermon presented by Bishop Edsel Ammons. Since 1900 there have been 38 pastors serving the church. The congregation is well known for its support of the community. Anyone in need is offered assistance. Funeral dinners are made available for the entire community where the family is involved with the church or not. Because the community is so supportive of the church, fundraiser activities work very well for the McMillan church. Whenever the budget seems a little bit short, another fish fry is scheduled and the community is there. The McMillan United Methodist Church expects to be a mainstay in the McMillan community for a good many years.